Diamond Valley Learning Centre in Melbourne is running mental health first aid courses to help staff and students develop skills to identify and help others who are struggling emotionally. do when someone in your centre is having a mental health crisis? 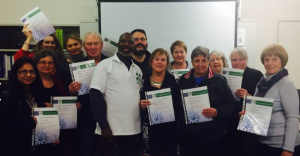 Diamond Valley Learning Centre recently ran its first Mental Health First Aid course to find out. The course trained participants in how to recognise when someone is going through a mental health crisis, and how to help them get through it. Course leader and mental health first aid instructor Francis Acquah has 25 years experience as a mental health nurse. He knows from first hand experience how important it is for people who might be struggling emotionally to get help sooner rather than later. You don’t have to be a mental health professional to be helpful, Francis says. Learning the skills for making that first approach and taking that first step to talk about what might be troubling someone is key. The course is not designed to turn participants into psychologists, or to teach people how to diagnose or treat a mental illness, much like someone trained in physical first aid isn’t expected to be able to set a broken arm. But it does help people pick up mental distress signals. Francis has taught doctors, nurses, financial counsellors, lawyers and adult educators – anyone who might be working with people who could be in mental health distress. The twelve-hour class is structured around an action plan that covers steps including how to approach, listen and give support to someone in distress and how to encourage them to seek help. For most of us a piece of bread burning in a toaster that triggers a fire alarm is little more than an annoying interruption to our work day. But for people from war torn countries or who’ve experienced bushfire, a fire alarm can trigger panic and distress. Renee DeBeer, Diamond Valley Learning Centre’s volunteer coordinator says it is incidents like these that prompted her to investigate setting up a Mental Health First Aid course. ‘I wanted to get the knowledge and the tools to be able to approach people I can see might be struggling and to be able to better nurture our team of volunteers. Renee has used the training a lot since she completed the course. Now she feels more able to talk to someone she notices might be having difficulty. Her goal is to help people with information and support until they can get professional help. Renee says she’s overcome her fear of saying the wrong thing and is more confident about broaching the subject of mental health. She believes she’s a better people manager as a result.